Brie Larson stars in a scene from the movie “Captain Marvel”. Photo: Walk Disney Pictures/CNS. Wit, positive messages and lavish production values buoy the origin story Captain Marvel (Disney). While some of the mythos in this adaptation of various strands of Marvel Comics lore, as well as other considerations, make it unsuitable for kids, the film is tame enough to be possibly acceptable for mature teens. Much of the humour derives from the fact that most of the action is set in a 1995 version of America where Blockbuster Video stores still flourish, people still use payphones and dial-up internet takes forever to connect. 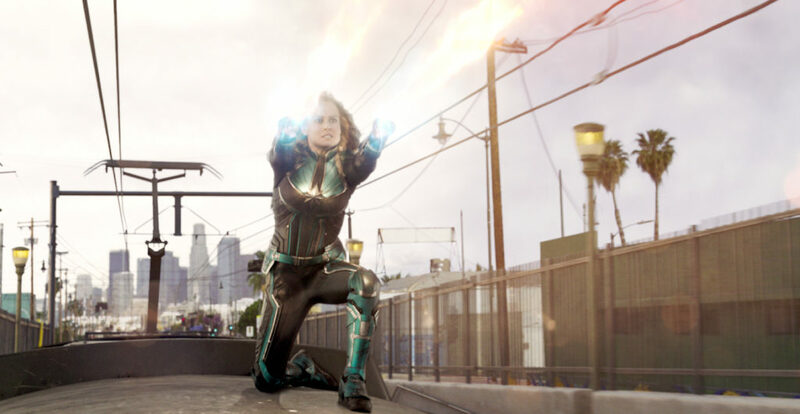 The superhero of the title (Brie Larson) arrives in this primitive milieu while faithfully serving the alien Kree civilisation that trained her as a warrior. Separated from her Kree comrades, she eventually joins forces with Nick Fury (Samuel L Jackson), who, in the mid-’90s, is a low-ranking officer in the Strategic Homeland Intervention, Enforcement and Logistics Division, better known as SHIELD. Together they go in search of Dr Lawson (Annette Bening), the scientist who seems to be crucial both to the intergalactic conflict and to Vers’ missing past. The need to work for peace and the resilience of the human spirit are among the themes emphasised in co-writers (with Geneva Robertson-Dworet) and directors Anna Boden and Ryan Fleck’s script. Plot complications also teach that time-honoured lesson about not judging a book by its cover. The inclusion of an invisible being called the Supreme Intelligence might confuse youngsters still being formed in their faith, however. While not exactly a substitute for God, this entity, which rules the Kree, certainly has some godlike powers. Older adolescents are unlikely to pay lasting heed to this aspect of the story, though, and may take the elements listed below in stride as well. The film contains much combat violence, most of it stylised but some of it harsh, fleeting anatomical humour, a few mild oaths, at least one rough term and a handful of crude and crass expressions.